The stylish Cruisers 3075 Express delivers excellent stern-drive performance and smooth handling, with comfortable overnight accommodations for up to six people with the convertible cockpit seating. The standard mid-cabin layout includes double berths fore and aft plus a well equipped galley and convertible dinette. Storage galore throughout the boat – a place for everything! Topside, the fully enclosed cockpit features triple-wide helm seating, a convenient wet bar with cockpit fridge, fore and aft lounge seating that converts to a large berth or sunpad, and a huge one-level swim platform. Molded steps provide safe, easy access to a clean foredeck with concealed anchor storage. 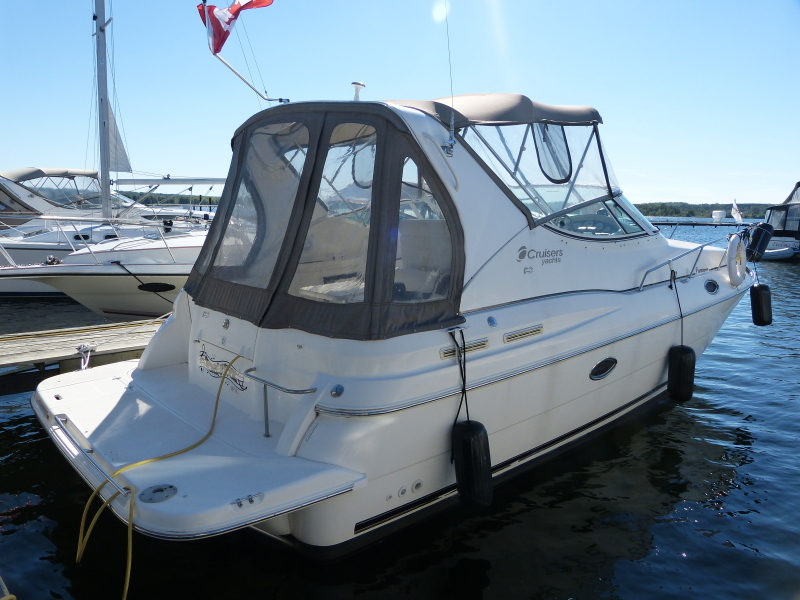 This Cruisers 3075 Express is equipped with the optional twin Mercruiser 5.0L MPI power plant upgrade, heat/air, windlass, two fridges, fabulous stereo system, and much more. She is extremely clean throughout and aggressively priced for a quick spring sale.